The orange and blue cardstock are from Prism, and the white is Neenah. I colored the images with a handful of markers I grabbed on my way to the couch. 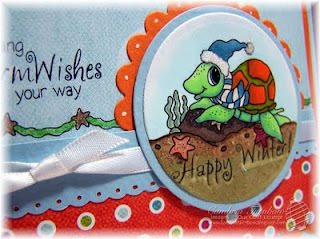 I used the Double Ended Tags from Spellbinders, and the Circle and Circle Scallop dies for both cards. Who says Christmas cards have to be red and green or traditional colors? Not me (and MME). LOL. I had a great time today in Nan Johnson's 5th grade class making monster boxes for Halloween. I'm amazed at how well her class did coloring! I'm looking forward to going back and making something for the Holidays. Great job kiddos! 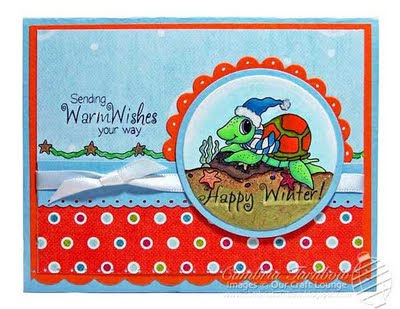 Paper: MME Colorful Christmas, Orange and Blue Prism, Neenah White. 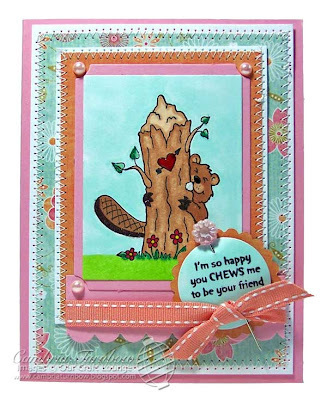 Other: Real Juicy Orange Sparkly Fluff, Quickie Glue Pen, Sakura Glaze Pen, Kaiser Jewels, EK Success Border Punches, Double Ended Tags, Circle and Circle Scallop Nesties, 7Gypsies Brads, Sugar Sparkles, Zip Dry, Scor-pal, Ribbon, atyou Spica Pens. I wasn't feeling so great over the weekend... I think I'm fighting off a cold. I had extra images from the coloring class with Marianne on Friday, so I curled up on the couch and my daughter and I colored all afternoon. I'm training her well... I cannot believe how awesome she can color and draw! I only grabbed a handful of markers, but it continually amazes me how much contrast you can get with just a few of those wonderful Copic markers! 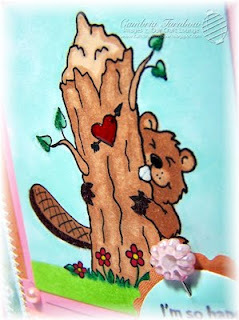 Of course this image is covered with Sparkly Fluff (Brown Sugar sprinkled on the sand, and Appletini Green on the seaweed) along with my new atyou Spica pens given to me by Marianne (the new colors... yipee!). One of the techniques I practiced was where you outline your image, then go outwards and lift up with the brush tip. I used my soft new BG000 to outline my little guy and swoosh away and out to make it look like he's under the sea. I LOVE all those new soft Copic colors... thank you Japan (and eP)! LOL. 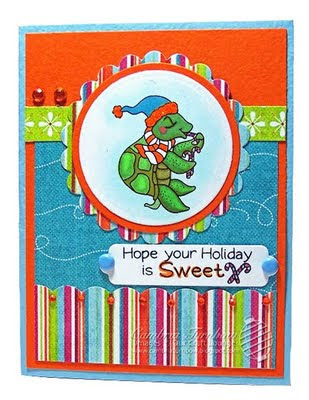 Paper: MME Colorful Christmas Designer Paper Kit, Prism Blue and Orange, Neenah White. Other: Sparkly Fluff, Quickie Glue Pen, Sugar Sparkles, EK Success punches (I got two new border punches at my LSS! 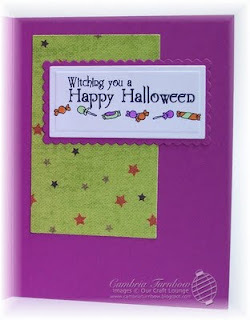 ), atyou Spica Pens, Circle Nesties, Circle Scallop Nesties, The Wizard, Zip Dry, Scor-Pal, Foam Dots, Satin White Ribbon. 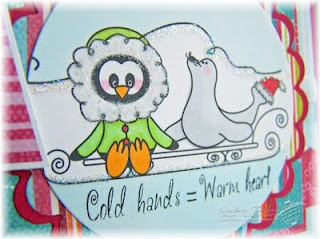 If you missed the awesome coloring tutorial by Marianne, click here to see it! I'm off to make little Monster Halloween boxes tomorrow at the Middle school with 5th graders! Wish me luck! Have a super week! I survived our class last night without my sweet assistant Kisa, although we all missed her VERY much! I hope Andrew feels better today. I have to say, we had a blast at Memories of Time with Marianne Walker and her husband Brian (who took video, so watch for that soon). Marianne helped us each color four images, then two of them we slapped on cards at the end. It was a full class, and OH SO FUN! Who wouldn't love sitting around coloring with Marianne down at MOT! Okay... so maybe my husband would not enjoy that... but still. I'm going back down to MOT later today to check on the girls as they get certifiable with Marianne! Have a great weekend everyone! Thanks for stopping by! Whatcha doing this weekend? 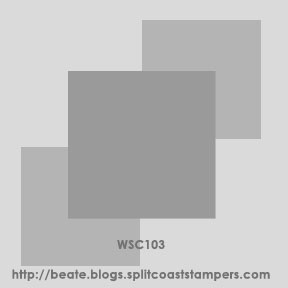 You have time to stamp? I hope so! Come and play along with us and let's see what you do with the weekend sketch! 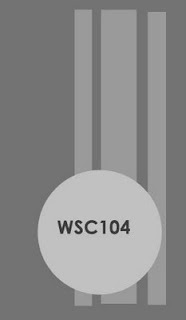 It's number 103, so don't forget to add WSC103 when you upload. Those snow balls are icy! They are covered with Sakura Stardust, then they have a thick layer of Glossy Accents on them! The bird and her parka fluff is covered with Rockin' Pink Sparkly Fluff. The cool brad on the right with the cute "well, hello" sentiment is from My Mind's Eye Abbey Road brads. 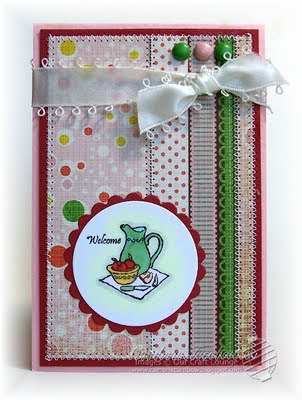 The ribbon is from American Crafts and the cardstock is from Prism. 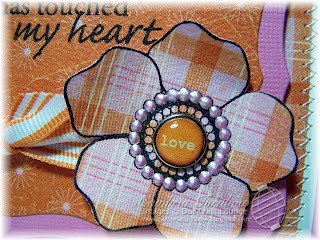 This one was quick and easy using my Marvy Punches for the scallop squares. The snow is our Chunky Sugar Sparkles, applied with the Glossy Accents. Want to play along? Need some inspiration? You can visit Beate's sketch team by clicking on their names. They always inspire me! Have a great weekend everyone! I'm heading down to MOT tomorrow night to do a workshop with Marianne Walker from Copic and my girls! I'll be solo... without my Kisa. I feel like I'm cheating on her! 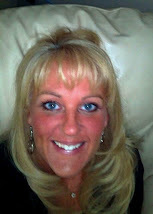 Her youngest son is having surgery (tonsils removed), so if you can send some thoughts or prayers his way over the weekend, it would be appreciated. Thanks for stopping by! This week has just been crazy busy. I truly do need more hours in the day.... don't you? 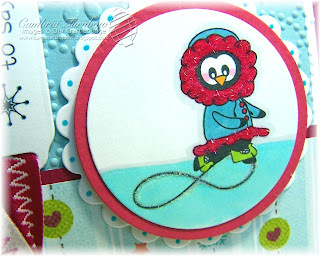 Just a super quick share today.I'm still playing with the stamp set Parka Penguins and Snowy Sayings. I'm really trying to get my desk/stampin area organized..... which is a huge job... trust me. I just can't stop getting new paper. DANG cute paper! 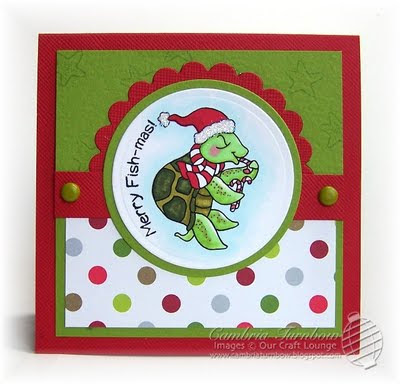 Here is some more of that paper from MME, called Colorful Christmas... I love it. :) Using up my scraps baby! When I get my mess cleaned up, I'm totally using the whole package! Every yummy piece! Have a super day! Thanks for stopping by! I'll see you tomorrow for Beate's Weekend sketch. Ha! 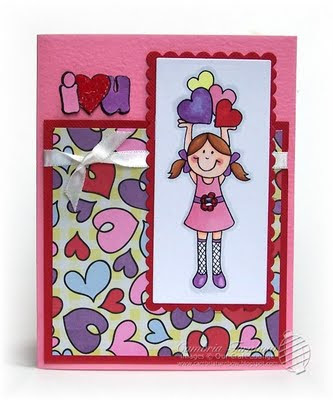 I love the stamp set Lola Love.... I think she is just adorable! So, I took two of our Halloween sets and witched her up for Halloween! The bowl of candy and the inside sentiments are from the set Granny's Potions, and the hat, spider web on her dress , spider on her hat, and Trick or Treat Sentiment in the web are from the set Holiday Cruiser. 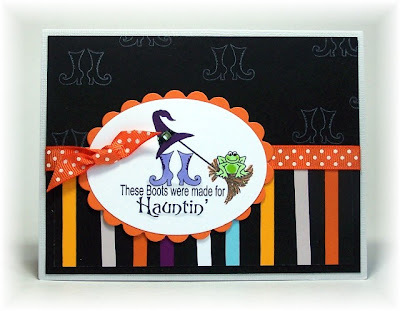 The cut out pieces are from the My Mind's Eye Designer paper pack called Boo! to You. 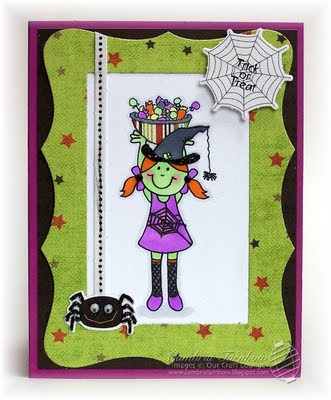 OMGosh... talk about making a bunch of easy Halloween cards with those paper packs! Adorable stuff! I might just cheat and whip up more cards with them! I added some Googly eyes and Black Eyeliner Sparkly Fluff to the spider and stamped the Trick or Treat sentiment in the center of the web and popped it up on foam dots. The paper frame I made with my Polka Dot Frame Nestabilities die. I took the inside die cut piece of designer paper (where Lola is) and added it to the inside of the card with the sentiment. I've decided to use EVERY piece of my scraps.... I'm going to throw them on the inside of my cards from now on! It kills me to throw them away.. and my desk is overflowing! Here is a close up of the details... you can click on the photo to see it larger. Can you see the Sparkly Fluff and Jewels on her hat? LOVE those Kaiser Rhinestones! She also has little black ones on her hair bows. I used my atyou Spica black pen to make the spider web and her socks all sparkle too. Paper: My Mind's Eye Boo! to You, Neenah White, Orchid Opulence. Other: Quickie Glue Pen, Sparkly Fluff, Kaiser Rhinestones, Googly Eyes, Polka Dotted Nestie Frame, Foam dots, Long Rectangle Nesties, Wizard, Zip Dry, Scor-Pal, Sakura Glaze Pens. Hope you are having a great week. Thanks for stopping by! Hey Stampers! Happy Tuesday! 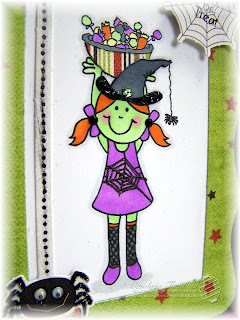 This week over at The Lounge, the Spotlight of the Week stamp set is Witch to Wear. Love this set by Debbie Corbari! Super easy fast one today! A little masking and a jewel for the hat and done! I used my Scallop Oval Nesties, a Green Rhinestone Jewel, some Black Eyeliner Sparkly fluff, and my all time favorite Eclipse Masking Tape! The designer paper is from American Crafts. The cardstock from Prism. I think the ribbon is Bo Bunny. Have a great Tuesday! Thanks for stopping by!! 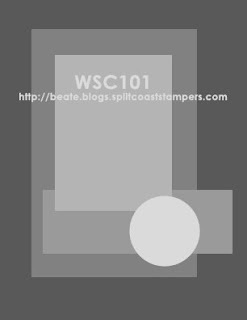 Did you see the Spotlight of the Week last week over at the OCL blog? 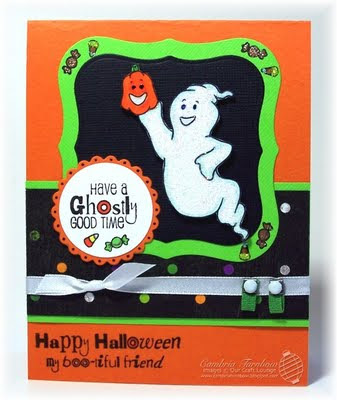 Deb Felts ROCKED the samples all week from the set Ghostly Greetings. She totally inspired me to get out my stamp set and play. I wish I had stamped the bottom sentiment on the other side of the card, but I will for the next one. 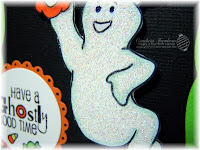 I cut out the ghost, then used my Quickie Glue pen to add glue then dumped our Sugar Sparkles all over. So sparkly! It really makes the card fun! Paper: Bo Bunny Designer Paper, Black, Neenah White, Limeade Bazzill, Orange Prism. Other: Circle Nesties, Label One Nesties, Big Shot, Karen Foster Primary Brads, White Satin Ribbon, Sakura Black Glaze Pens, Sakura Stardust Pen, Quickie Glue Pen, Sugar Sparkles, Lemon Drop Yellow Sparkles, Scrapbook Adhesive Foam dots, Scor-pal, Zip Dry. Hope you are having a great week! Thanks for stopping by! Have someone you need to send a reminder to? I lost my Aunt to Breast Cancer, and I've had a couple very dear friends fight the fight. Thank goodness that early detection saved their lives. I don't know if you noticed, but in the stamp set Granny's Support Team, these breast cancer awareness images are included. What better way to gently remind someone that you love them, and it's time to get em squished at the same time! 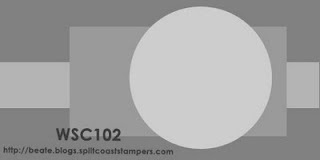 The designer paper is new from My Mind's Eye, Ooh La La line. LOVE IT!! Oh my.. it's SO pretty.. and I have it all. Neener neener. *wink*. I added some Kaiser Rhinestones right on the ribbon. The main image is popped up with Jody's Foam dots. The bra is paper pieced. Easy peasy... you could whip one out for each of your friends. Hope you had a great weekend. Kisa and I had a blast at Memories of Time celebrating National Card Making day. Thanks for stopping by! 100! Can you believe it? 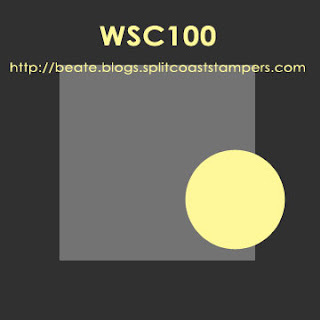 Make sure to visit Beate's blog for all kinds of fun prizes to help celebrate our 100th Weekend Sketch Challenge! 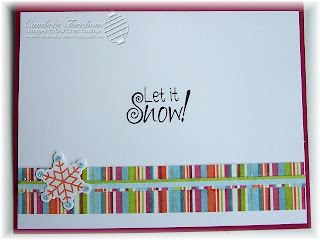 I haven't had much stamping time lately, so I was happy to see such an easy sketch. This one EVERYONE can do! Hope you can find a few minutes to play along this weekend! 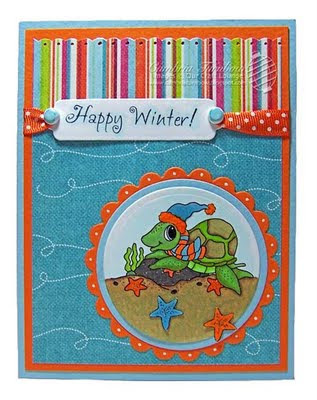 After all, it is National Card Making Day! This card took only 10 minutes to make. Of course it helped that yesterday, I got a delivery from eP with NEW PAPER! I fell in love with all the plaid papers at Summer CHA. I'm so thrilled to get my hands on it! This paper is from My Mind's Eye. The orange paper in the center is the opposite side of the paper. 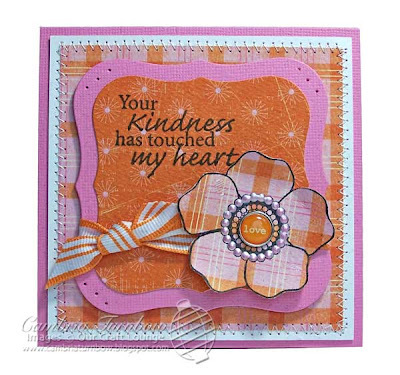 It's nice and thick, so all I did was stamp the big flower from Thankful Flourishes on the paper, and cut it out. The brad in the center is also from My Mind's Eye,.... easy peasy right? I LOVE those matching brads! The beautiful pink dots around the center is Pastel Raspberry Liquid Pearls. Check out the sketch team! Hope you an play along over the weekend! I'm spending the day down at Memories of Time with Kisa teaching classes on Saturday! I can't wait to hang out with the girls! Happy Card Making Day! Have a great weekend!